Dorothy Kerper Monnelly speaks for the landscape through her photographs and also through her conservation advocacy. 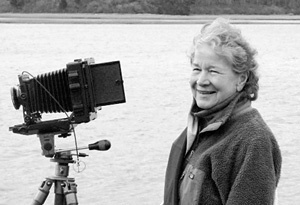 Her award-winning marsh photography culminated in the publications of her critically acclaimed book of black and white landscapes. Between Land and Sea: The Great Marsh (George Braziller Inc., 2006). The book won praise from both the fine art and conservation communities, and the large-format black and white photographic essay has introduced many to the unique beauty of that fragile landscape and rich ecosystem. In addition Monnelly has photographed extensively in the lava fields of Hawaii, the California desert, in Iceland, and in Maine, where she was artist-in-residence at Acadia National Park. In For My Daughters (Marquand Books, 2012), her second book, Monnelly paired her photographs of the natural world with her mother's poetry, creating a dialogue between photo and poem. Her current release and third book, waterforms, (Verlag Kettler, 2016) continues her focus on capturing the beauty and transformative power of water, presenting a compelling collections of abstract compositions. The traveling exhibition Fragile Waters featuring Monnelly, along with Ansel Adams and Ernest H. Brooks II has traveled since 2013 to The Mariners' Museum, The Tampa Museum of Art, The Massillon Museum, Las Cruces Museum of Art, the Maritime Museum of San Diego, The San Juan Island Museum of Art, and will travel on to the San Jose Museum of Art in 2017. Monnelly's large-format gelatin silver prints are in the permanent collection of the National Museum of Women in the Arts, Washington, D.C., The Peabody Essex Museum, the five museums mentioned above, as well as numerous private collections. Her photographs have been exhibited at Gallery Obscura, Denver, Benham Gallery, Seattle, Panopticon Gallery, Boston, Genoa, Italy, among others. A collection of Monnelly's black and white photograph from her Ice Pattern series were on exhibit at Photo Vernissage 2012 in St. Petersburg, Russia. Legendary naturalist Edward O. Wilson called Monnelly "the Ansel Adams of the wetlands." In her introduction to the Great Marsh book, Jeanne Falk Adams, former CEO of the Ansel Adams Gallery,writes: "I find myself responding emotionally and know the photographs touched me... there is a difference between being clever and being great." Ipswich resident and renowned author John Updike commented, "Your photos are just lovely, and the marshes are a noble subject."